Stephen and Karen Steiner are on staff with Campus Crusade for Christ, an interdenominational ministry that seeks to bring the good news of Jesus Christ to college campuses around the world. Once they are done raising their additional support, they will be working with the Indiana Cru team reaching and spiritually building up college students across Indiana. Indiana Cru is currently active on 25 of the 104 campuses in Indiana. We are praying that with Gods help we can bring this number to 50 campuses that we are active on over the next few years. We will be helping in this effort, as well as with the outreach in Ohio, Illinois, and Michigan by working with the Operations Team in the Great Lakes Regional office. Karen will be working as a project specialist this year serving with the operations team and sending team, as well as where ever else she is needed, and Steve will be the regions technology specialist. Karen grew up in Marion, Ohio. When she was in high school she went with her church to a youth evangelism conference in Los Angeles called DCLA. It was from her experience there that she really developed a passion for sharing her faith with others. When she graduated from high school, she started working at summer camp during her summers to reach students there for Christ. In addition, while she was going to college at Otterbein College in Westerville Ohio, she became involved in Campus Crusade for Christ there right away, and eventually was part of the ministry team there. Steve grew up near Bluffton, Ohio. Going to a mission oriented church for most of his life, he felt the call to be involved in missions early in high school and was considering foreign missions. Then in February of 2001 he was asked to help build a website for Youth for Christ in Bluffton by then Youth for Christ director Jim King. He accepted and has worked with that organization for over 9 years since, helping them with technology & digital media. He went to college at James A. Rhodes State College in Lima Ohio, and was on the ministry team for Campus Crusade for Christ while he was there; first as the techy, and eventually as the leader of the ministry team. Karen and Steve met at the annual Christmas Conference that the Great Lakes region of Campus Crusade for Christ holds in Indianapolis, Indiana. 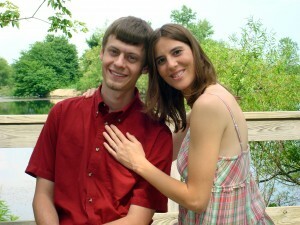 A year later they got married and for the past two years, they have been missionaries with Campus Crusade for Christ. Since Steve has been the only one working full time, they are currently meeting with friends, family, churches, and community professionals to let them know more about what they both have been doing and will be doing with Campus Crusade, and to help others work through how they can be ministry partners with them so that they can both be fully supported. If they haven’t met with you yet they desire to do so. Feel free to contact them!